Get cuddly with these beautifully unique, hand-made sock monkeys, lovingly sewn right here in Greytown. John Nelson, a Swedish immigrant to the United States, patented the sock-knitting machine in 1869, and began manufacturing work socks in Rockford, Illinois in 1890. The iconic sock monkeys made from red-heeled socks emerged in 1932, the year the Nelson Knitting Company added the trademarked red heel to its product. This red heel gave the monkeys their distinctive mouth. During the Great Depression, American women first made sock monkeys out of worn-out Rockford Red Heel Socks so their children could enjoy toys, at no extra cost to the household. 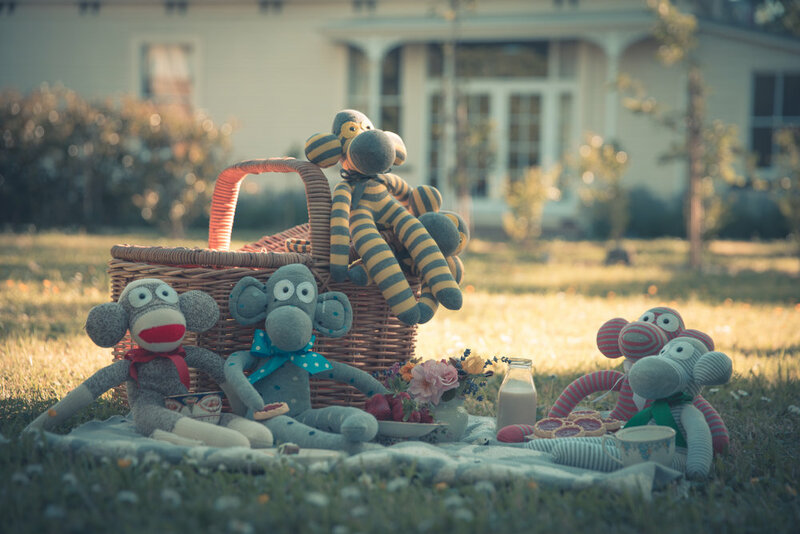 The Greytown Free Range Monkey Company has been producing New Zealand made artisan sock monkeys since 2002. Each is unique, entirely handsewn and made from only new materials. Sock monkeys are easy to care for - they only require cuddles from their new owners, and the occasional bath if they venture into any sticky situations. The Greytown Free Range Monkey Company Sock Monkeys are available exclusively from Tapestry on Main.